A new Kagero G Guardian appears, designed for targeted Retires, along with a Counter Charging Heal Trigger. AUTO Generation Break 1: [Soul Blast 1 & Choose 1 face-down G Guardian from your G Zone, flip it face-up] When this card is placed on (GC), you can pay the cost. If you pay it, choose 1 of your opponent’s Grade 1 or lower Rear-guards that’s at Rest, Retire it. When this card is discarded from your hand for the cost of Calling “Supreme Heavenly Emperor Dragon, Advance Guard Dragon”, if you have 1 or less face-up cards in your Damage Zone, you can pay the cost. If you pay it, Counter Charge 1. For Today’s Card, we’re introducing the following from “Fighter’s Collection 2017” (on sale May 12th, 2017): The Generation Break 1 《Kagero》 G Guardian, “Supreme Heavenly Emperor Dragon, Advance Guard Dragon” and the Heal Trigger “Positive Dracokid” that activates its ability when it’s discarded from the hand for the Cost of Calling the related G Guardian. A 《Kagero》 G Guardian that retires your opponent’s Unit!! When “Supreme Heavenly Emperor Dragon, Advance Guard Dragon” is placed on the field, you can Soul Blast 1 card, and in exchange, you get to Retire 1 of your opponent’s Grade 1 Resting Rear-guards. 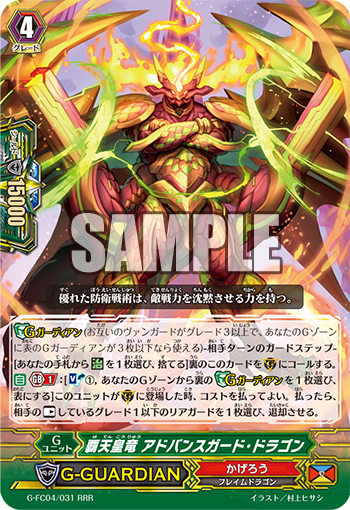 It’s a Retreat-type G Guardian for 《Kagero》, just like “Flame Wing Steel Beast, Denial Griffin”, but while “Advance Guard Dragon” can’t retire an opponent’s attacking Unit, it does have the noteworthy point of not requiring a Counter Blast. Also, if it Retires a Unit that Boosts, it is possible to alter the game situation by suppressing your opponent’s Power by that much. Continuing, “Positive Dracokid” activates its ability when it’s discarded to pay the cost of Calling “Supreme Heavenly Emperor Dragon, Advance Guard Dragon”. When your Damage Zone has 1 or less face-up cards, you can Soul Blast 1 in exchange for Counter Charge 1. So next turn you’ll be ready for the Stride Skill of “Dragonic Blademaster”. Q. Can you discard “Positive Dracokid” for the Cost of Calling G Guardians other than “Supreme Heavenly Emperor Dragon, Advance Guard Dragon”? Q. Can you Call “Supreme Heavenly Emperor Dragon, Advance Guard Dragon” while you have no face-up G Units? Q. When there are 3 face-up G Guardians in your G Zone, can you activate the effect of “Supreme Heavenly Emperor Dragon, Advance Guard Dragon” by flipping a G Guardian face-up?